Practice drawing the mechanism as illustrated in the video. Begin by opening a full-size sketcher window by clicking on the MarvinSketch frame at the bottom of the page. Follow along in the video. When using the 2-electron arrow, pay close attention to the dashed line and the blue parentheses. 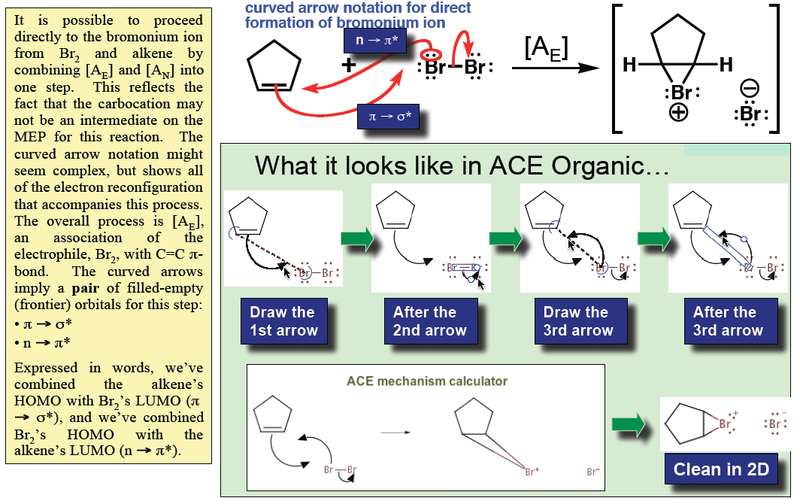 Use the ACE Organic mechanism calculator to check your curved arrows. To do so, paste the contents of one box from the mechanism (include the curved arrows) into the calculator's MarvinSketch window. Then click on View Products. The calculated products should match what you've drawn in the subsequent box. Consider the frontier molecular orbitals involved that are reflected in the curved arrows that you've drawn. A description is provided below where MEP is the minimum energy pathway.